eavesdropping on your secure connections? the authentic site's fingerprint CANNOT be duplicated! Fingerprinting ten remote servers. . .
forms strong evidence that something is intercepting your web browser's secure connections and is creating fraudulent site certificates. the bottom of this page for an explanation of the complexities. The Internet is a cooperative PUBLIC DATA NETWORK. Its data traffic flows around the globe freely, transported by an incredible variety of intermediate carriers. These carriers cooperate because they need each other equally: “I'll carry your traffic if you'll carry mine.” And the system works. But with all of this traffic zipping around all over the place, in full public view, how do we KNOW that we are really connected to our bank, our medical records database, or any other public or private website? Websites are (obviously) easy to create, so copying a popular website and redirecting traffic there would not be difficult. And, unfortunately, the world has no shortage of people who would like to do that. The original un-secured HTTP web connections never attempted to authenticate or encrypt their connections. Users who knew enough to wonder and worry could only hope that they were actually interacting with the website they intended. And that was fine back when the Internet was just a curiosity. But the Internet has grown into a resource where people conduct business, place orders, exchange stock, refer to their medical histories, perform their banking, and everything else—very much as they do in the physical world. For the “cyber versions” of these activities to be feasible, users expect, need, and must have security and privacy. The “S” added to the end of the “HTTP” means SECURE. The presence of the unbroken key or the lock icon on the web browser once meant that the connection between the user and the remote web server was authenticated, secured, encrypted . . . and not susceptible to any form of eavesdropping by any third party. Unfortunately, that is no longer always true. To enhance their users' security and privacy, an ever increasing number of web sites are switching from traditional “HTTP” to the more secure “HTTPS” connections—like THIS web page. This type of secured connection is known as SSL or TLS (“Secure Sockets Layer” and “Transport Layer Security”) two names for the same thing. What's significant is that the data sent back and forth over any HTTPS/SSL/TLS connection is encrypted by technology no one knows how to break. Really, no one. It's truly secure. In the early days of the Internet, the encryption provided by HTTPS connections was difficult and time consuming to establish, so these “expensive” connections were usually reserved for logging into a site (to protect the user's name and password) or when submitting very sensitive information, such as private credit card numbers and purchasing data. Since HTTPS connections were once used sparingly, anyone wishing to monitor, watch, record and log the actions of users on the Internet could do so easily, simply by eavesdropping on the data moving through the wires. But as technology has advanced, the cost of employing unbreakable encryption for all connections has become feasible. So today more and more websites are switching to always using encrypted HTTPS connections. Private institutions—corporations, schools, and other organizations—have responded to this “loss of visibility” into every detail of their employees' and students' Internet usage by deploying new technology known as “HTTPS Proxy Appliances”. These devices circumvent our most basic assumption and guarantee of Internet browser privacy and security. they cannot see . . . so they insist upon seeing everything. been signed by a higher authority that the browser already trusts. There are entities known as "Certificate Authorities" (CA) to whom web sites prove their identity in the real physical world using incorporation documentation, Dun & Bradstreet records, their publicly known telephone numbers, and so forth. When a web site has proven its identity with sufficient certainty, the Certificate Authority (CA) will put its reputation on the line by digitally signing the site's security certificate which contains an assertion of its identity. When an Internet browser establishes a secure connection with a remote site, that site must provide that signed certificate for the web browser's inspection. The web browser already contains a (long) list of all the trusted and reputable certificate authorities that exist in the world. So the browser is able to verify the authenticity of the certificate provided by the web site by verifying that it was properly digitally signed by one of the many certificate authorities it trusts to sign website identity certificates. How is this elegant system subverted? Any corporation, educational institution, or other Internet connectivity provider who wishes to monitor every Internet action of its employees, students or users—every private user ID & password of every social networking or banking site they visit, their medical records, all “secure” eMail . . . EVERYTHING—simply arranges to add one additional “Pseudo Certificate Authority” to their users' browsers or computers. It's that simple. fact is that since they CAN, in the USA they could be compelled to do so. For example, suppose that “Bendover Industries” installs a commercially available “SSL Proxy” (also known as an HTTPS or TLS Proxy). Then, as part of prepping computers for use inside their network, Bendover's IT department simply adds one additional “trusted” Certificate Authority to each computer. That's all it takes. Now, whenever anyone inside Bendover's network makes a “secure” connection to any remote public web site—their bank, Google Mail, Facebook, anything—that connection is intercepted by Bendover's SSL Proxy appliance before it leaves the building. On-the-fly, the SSL Proxy Appliance creates a fraudulent “spoofed” web server certificate in order to impersonate the intended remote web site, and it signs that fraudulent certificate itself using the signature of the also-fraudulent Certificate Authority that was previously planted inside the user's browser or computer. Because the impersonation is perfect, neither the browser nor the user can readily detect that they do not have a securely encrypted direct connection to the remote web site. Their browser shows every facet of a standard secured SSL connection—all the locks and pretty colors and everything we have been trained to look for and check for are present . . . Instead of connecting to the remote web server, the browser is “securely” connected only to the local Proxy Appliance which is decrypting, inspecting, and logging all of the material sent from the browser. It inspects all content to determine whether it abides by whatever arbitrary policies the local network is enforcing. It's users have NO privacy and NO security. Or perhaps it just silently logs & records everything for possible future need. Either way, it has obtained full access to everything the user enters into their web browser. A case in point: Blue Coat Systems, Inc. In this posting from more than two years ago they explain how the web's increasing use of SSL & TLS encryption [primarily for privacy, of course, which their technology violates] has made user activities more and more invisible. Quoting verbatim from the posting: There was a time when a web proxy that handled web pages in the clear covered almost all the web pages of interest for an organization's policy compliance. Today, webmail offerings routinely use SSL encrypted logins and even maintain SSL connections for the web based email session. SSL is also used today wherever personal credentials are entered, whether it's a social networking site, shopping or other entertainment site. Because of the widespread use of encryption on websites, making sure you use an SSL proxy (basically a proxy that can inspect and enforce policy around the contents within an SSL session) is more important than ever. And speaking of “policy”, here's their blog posting from 2013-01-18 where they decide to remove their “checkbox” for automatic detection and filtering of “LGBT” (Lesbian, Gay, Bisexual, Transgender) material. Quoting again from the posting: Based in part on customer feedback, we have decided to remove the LGBT category from Blue Coat WebFilter. Content will cease to be rated in the LGBT category effective immediately, and the category will be removed from Blue Coat WebFilter in the next product release. This of course means that until now they have been offering to filter and alert for LGBT content. I take no position about the morality or ethics of this—though it would be safe to say that as an advocate for individual responsibility and privacy, I'm not a fan. I point it out merely to demonstrate that the privacy-invading technology does indeed exist and is readily available to anyone who desires its deployment. whether and when SSL Interception is being used on them! Once the SSL Proxy Appliance has decrypted, inspected and judged the user's content, it establishes a second secure connection to the remote web server—this time impersonating the user. Assuming that the user's request and data meet with the network's policies, or perhaps after having all been logged, the data is re-encrypted through the second connection to the remote web site . . . just as if nothing had happened. Can this SSL Interception be PREVENTED? No. But it CAN be reliably detected because it is NOT POSSIBLE to COMPLETELY spoof ANY security certificate! Public and Private keys form cryptographically matched pairs. It is not feasible to derive one from the other, yet what one encrypts only the matching other can decrypt. Website SSL security certificates provide the site's Public cryptographic key which is the public side of the server's secret Private cryptographic key which is never publicly disclosed. Only the certificate's public key can be used to encrypt data which the remote server can decrypt only using its matching private key. Since the SSL Proxy Appliance does not have the private key of the remote server—because only the remote server has it—the fake & fraudulent certificate the SSL Proxy provides to the user's web browser is forced to use a different public key for which it does have a matching private key. And that means that no matter how hard any SSL-intercepting Proxy Appliance may try to spoof and fake any other server's certificate, the certificate's public key MUST BE DIFFERENT. Anyone examining an SSL certificate (like this page or your web browser) can create a “cryptographic hash” or “digest” of the certificate's contents. Cryptographic hashes are complex mathematical algorithms which carefully process every single bit of what they “digest.” They have the amazingly property that if even one bit inside the certificate is changed, an average of half of the fingerprint's hash bits will change in response! In other words, when such a cryptographic hash is used to “fingerprint” a certificate any change, no matter how small, will result in a COMPLETELY different fingerprint. Fingerprints offer incredibly sensitive and strong detection of anything changed anywhere in a security certificate. Certificate fingerprints were originally based upon the “MD5” (Message Digest 5) hashing algorithm. But over time researchers found MD5 to be a bit weak in some special cases which might have been exploitable. So the entire industry (and this web site) has switched over to using the newer, stronger and even more secure “SHA1” (Secure Hashing Algorithm 1) hashing algorithm. Let's bring it home . . .
All SSL-intercepting Proxy Appliances MUST provide a fraudulent spoofed certificate containing a public key for which it has the matching private key, and that private key cannot be the same as the actual remote server's because private keys are a closely held secret and no one knows any server's private key. HAVE AND WILL HAVE radically different fingerprints. They will not be remotely similar. And now we know what this page does! YOUR web browser's Internet connection MAY be intercepted by your employer, school, church, ISP or whatever organization is providing the Internet connection. But GRC's connection is NOT being intercepted by anyone. We use the “Tier 1” provider “Level 3” to connect directly to the Internet Backbone with no third-party between us and any remote website. So, with this page, WE can obtain any website's authentic HTTPS fingerprint to show you what it SHOULD BE.
. . . or will it be the necessarily different fingerprint of a fraudulent SSL interception certificate that was created for the deliberate purpose of attempting to fool you and your web browser? 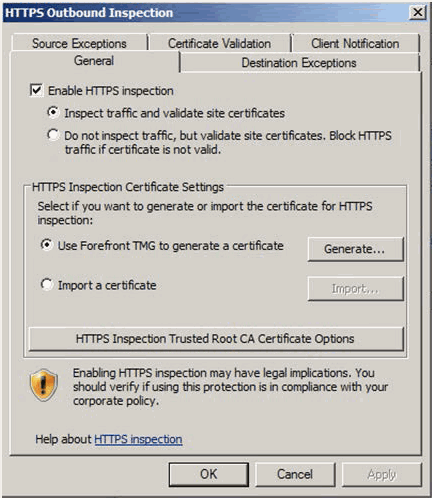 If you are currently—right now—viewing this page from within ANY network that is intercepting and spoofing SSL connections (the dialog box above clearly shows that Microsoft offers this “feature”), and if THIS specific connection was intercepted, the fingerprint of GRC's authentic SSL security certificate shown above will NOT match the fingerprint shown by your web browser. And the same is true for any websites your local network may be secretly intercepting. Right-click somewhere on the page. Select “Properties” at the bottom of the pop-up menu. Click the “Certificates” button on the Properties page. Verify that the “Issued to” name exactly matches what this GRC page shows. Click the “Details” tab to change views. Set the “Show” selector to “<All>” if it isn't already. Scroll down to the end of the list to “Thumbprint” (which is what Windows calls it). Click on the “Thumbprint” item to select it and show the full thumbprint in the window. Click on the padlock at the far left end of the URL address bar. Click the More “Information...” button. Click the “Security” icon/tab at the top of the “Page Info” dialog. Verify that the certificate's name under “Common Name (CN)” exactly matches what this GRC page shows. The SHA1 fingerprint is shown under “Fingerprints”. Click the [https padlock] icon at the far left end of the URL address bar. Verify that the certificate's “Common Name” exactly matches the name shown on the GRC page. Scroll to the bottom to view the certificate's SHA1 Fingerprint. YOUR web browser also just obtained DIRECTLY from the remote web server. But IF this SSL page was intercepted, its certificate fingerprint will HAVE TO BE DIFFERENT since authentic SSL certificates are impossible to perfectly duplicate. A Crucially Important Spoofing Exception!! While researching ways to help our visitors verify their connection fingerprints, we hit upon one type of certificate which, when properly handled, as they have been in the Firefox and Chrome (and Chromium), but not Internet Explorer . . . CANNOT BE SPOOFED at all!! (EV) certificates will display the extra "Green" indication! This www.GRC.com web site always uses Extended Validation (EV) certificates. So if you are viewing this EV site through a properly-designed web browser, such as Firefox or Chrome (but not Internet Explorer, since Microsoft deliberately allows EV indications to be forged) and you DO see the special EV treatment in the address bar, then you KNOW your connection to US is NOT being intercepted (and also that this page's contents have not been altered!) But if the special EV indication is NOT being displayed . . . then you instantly know that something IS intercepting and spoofing this web site's certificate! Or to put it another way: If you are using Firefox or Chrome somewhere that never shows any EV certificates, then you ARE using a connection that is being intercepted, and your web browser is being presented with deliberately fraudulent certificates . . . since EV certificates cannot be spoofed! Note that because extended validation certificates are completely spoof-proof (under Firefox and Chrome) we show the true EV status for every fingerprinted site. This allows you to determine whether any site you select should be showing as EV in your Firefox or Chrome browser. Please see our The Special Power of Extended Validation Web Site Certificates page for an in-depth discussion of the value and spoofing-resistance of extended validation certificates. What can go wrong with this test? But companies with a massive and widely distributed web presence, such as Amazon or Google, may deploy many different security certificates across their many globally distributed servers and web sites. Multiple certificates may be easier for them to obtain and manage, and their security is not reduced. But it does mean that not every user of their servers (like you and this GRC page) would necessarily obtain the same security certificate. This means that a simple comparison of certificate fingerprints could erroneously lead people wishing to test these huge websites to conclude that their connections were being intercepted, when they have simply received a different valid certificate than the one received and shown by this web page. The best solution is to test smaller sites that are known to be using single certificates, or sites using the completely unspoofable extended validation (EV) certificates with an EV-honoring web browser such as Firefox or Chrome (but not Internet Explorer, which doesn't properly verify EV certificates). At least two anti-malware products — BitDefender and Kaspersky A/V — operate as local HTTPS intercepting proxies. They obviously do this in order to scan the machine's secured and encrypted inbound web content for anything malicious. But this is quite disturbing because, even though it's for a good purpose, there are other ways to access the content after it has been decrypted and before it reaches the web browser. So this incredibly intrusive and security-breaking approach is not necessary. And this also has very negative side effects, such as breaking the display of all EV (extended validation) web sites. This is really bad. Since you are ALWAYS being intercepted, you can NEVER verify whether it's only once . . . or more. (Note that I can and do vouch for the value of Kaspersky as a terrific security threat research group. But this approach is wrong.) If it is possible to temporarily disable this aspect of their “protection”, then you could perform remote interception testing while the local interception is disabled. permanently enable or disable this single aspect of BitDefender's operation. Note that since extended validation (EV) certificates cannot be spoofed, any use of these machine-resident connection intercepting systems will disable all extended validation certificate display. As you can see, depending upon how we ask for the certificate, with or without the “www” prefix, we receive two entirely different certificates. They have different certificate “Common Names” (Certificate Names) and, of course, radically different fingerprints. The lesson here is that you MUST be vigilant about comparing the “Certificate Name”, also known as the “Common Name” on the certificate with what this GRC page shows here to be sure you are examining and comparing the SAME certificate. The result of not being careful, would be a “falsely positive” belief that SSL interception was occurring when it is not. And we don't want that. SSL-intercepting Proxy Appliances are highly configurable. In fact, in many cases the so-called “C-level” executives within a corporation—the CEO, CFO, CIO, CTO, COO, etc.—do not have their own SSL connections intercepted at all! It's only the lowly and less trusted peons who need to be spied upon. So, theoretically, specific web sites like this one could be excluded from SSL-interception, decryption and logging. Therefore, if THIS SSL Fingerprinting facility at GRC were to become popular, SSL-interception Proxies could make an exception and deliberately not intercept your browser's connections to GRC. Then the GRC fingerprints would match, and visitors would be lead to falsely believe that NO OTHER connections were being intercepted. WE WILL IMMEDIATELY UPDATE THIS PAGE. But that's why this page obtains the fingerprints for many of the top web sites on the Internet . . . they would all need to be bypassed for your web browser to obtain the same fingerprint for them as GRC . . . which seems unlikely to be done. And that's also why we added the “Custom Site Fingerprinting” feature: Only you know which domains you want to verify are NOT being intercepted. VERY unlikely, but needs to be mentioned . . . But there's a solution to THAT as well! All you need to do is go home (or anywhere that's unlikely to have SSL interception in place) then bring up and print just the first page of this GRC Fingerprints page. Now you'll have a handy hardcopy showing the authentic fingerprints of those top popularity web sites shown at the top when this page is first presented. Bring the printout back to where you're wondering about SSL interception and filtering. Bring up a few of those sites and compare their fingerprints to the handy printout. If they match, you know absolutely that they are NOT being filtered. And if they don't match . . . something fishy may well be going on. Send us any feedback, questions, thoughts, ideas, etc., about this HTTPS connection fingerprinting page. Michael Horowitz's “Defensive Computing” blog at ComputerWorld has a terrific and even more extensive explanation of this issue. If you're interested in reading more about this, check it out! A WIRED Magazine article discussing a device made by “Packet Forensics” for perpetrating exactly this sort of secretive connection interception. A comprehensive White Paper (1.27 mb PDF) which accompanied Jeff Jarmoc's presentation at the Black Hat Europe, March 14, 2012, conference. Jeff's presentation and paper were titled: SSL/TLS Interception Proxies and Transitive Trust. A Spanish language explanation of these ideas: Miguel Mollejo, a valued contributor to GRC's public newsgroups, has thoughtfully produced a Spanish language explanation of these ideas.